1. Place 300ml of the red wine into a pan and bring to the boil. Reduce by about four-fifths, until 60ml is left. 2. Put the cream into a saucepan over a medium heat, and bring to the boil. In the meantime, chop the chocolate into small chunks and place in a bowl. 3. When the cream has reached boiling point, pour a third of it over the chocolate and whisk thoroughly until smooth. Add each remaining third, whisking well each time, until completely smooth. 4. Add the butter and whisk to incorporate. Add the reduced wine plus an extra 20ml, and the vinegar. 5. Pour into a container and place in the fridge until fully set. 6. When you’re ready to assemble the truffles, scoop out balls of the ganache using a melon baller. Place the truffles in a tray lined with baking parchment and place back in the fridge for 15 minutes. 1. Whizz the freeze dried raspberries in a small food processor until they become a fine powder. 2. Remove the truffles from the fridge and roll in the raspberry powder. 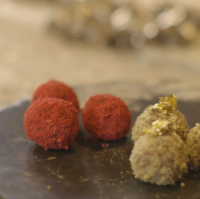 Click here to see Heston's white chocolate miso truffles recipe. Click here to see Heston's millionaire shortbread truffles recipe.